A follow-up on Thomas Lumley follow-up post on Miles McBain post about quotation. I’ve already written about lazy evaluation, but here is more about that concept. Here, b is defined as a function argument, but never evaluated. So no error. This strategy is called “lazy” as it does “the strict minimum” of evaluation (remember that evaluation is looking for the value of a symbol). As b is never evaluated, we don’t have any problem, R never tries to look for the value of non_existing_variable. Lazy evaluation is not R-restricted: it is also found in other languages (mainly functional languages). Its opposite is strict/eager evaluation, which is the default in most programming languages. Lazy evaluation is implemented in R as it allows a program to be more efficient when used interactively: only the necessary symbols are evaluated, that is to say that only the needed objects will be loaded in memory and/or looked for. The downside being that it can make a program less predictable, as you are never 100% sure a symbol will be evaluated (but this is for more advanced use-cases). It’s a typical mechanism for functional language, as it allows functions to be defined without any values in it. That means that you can create this object without a and b having a value. The expression given as function arguments are not evaluated before the function is called. Instead, the expressions are packaged together with the environment in which they should be evaluated and it is this package that is passed to the function. Evaluation only takes place when the argument is required. Here, if the output does not surprise you, it’s because you already have understood what is lazy eval (good news, right! 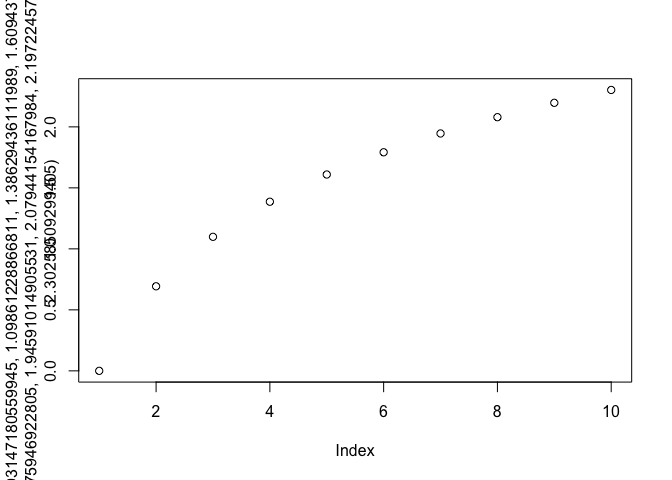 ): when R tries to access the value of mean_of, it looks for the value of x. At that exact moment, as the value of x has changed (no NA), you have the mean of the new x. If mean_of had been evaluated as soon as the function was called, the value of mean_of would have been NA. You can see that each element has a different value. If the elements had been evaluated at the moment the function was called, they would all have the same value (i.e the Sys.time of when the function is called). As you can see, the memory used by my R session has changed when I actually needed diamonds. This latter is no longer a promise, but a loaded dataset in my environment. Here is an example of Non-standard evaluation with substitute: even if I’m passing txhousing as a symbol, substitute(txhousing) does not behave as nrow(txhousing). The symbol is not evaluated in the standard way, the promise is still a promise, and the symbol txhousing does not bring the object in the environment. ##  "You called a dataset with 2870"
Keep all this in mind, we’ll be back to it in a few. Ok, now, now let’s dig deeper into lazy evaluation. Let’s start with the beginning: the R-Manuals. promises and lazy evaluation are referred to several times in the R Language Definition. Promise objects are part of R’s lazy evaluation mechanism. They contain three slots: a value, an expression, and an environment. When a function is called the arguments are matched and then each of the formal arguments is bound to a promise. The expression that was given for that formal argument and a pointer to the environment the function was called from are stored in the promise. What that means is that: when calling a function, arguments are turned into promises. These promises contain: an expression, and an environment (no value at first). In a sense, what this object holds is not a value, but a recipe for a value, saying “evaluate this expression in this environment”, and this recipe is called only when we need it. Until that argument is accessed there is no value associated with the promise. When the argument is accessed, the stored expression is evaluated in the stored environment, and the result is returned. The result is also saved by the promise. The substitute function will extract the content of the expression slot. This allows the programmer to access either the value or the expression associated with the promise. So, here’s a clear definition for the substitute function: an “expression slot content extractor” :) In other words, when passing arguments to a function, they are immediately turned into a promise, a data structure with an expression, and a recipe for a value. But here’s the thing: thanks to lazy evaluation, you can access this expression without having to actually give an argument a value (i.e., without having to look for its value). With our newly acquired knowledge, we can tell what’s happening here: b is created as a promise, containing the expression non_existing_variable. It contains no value, but as we never try to actually evaluate it (i.e. try to access its value), there is no error. R extracts the expression contained in col_name_computation, puts it in col_name_computation_sub, which is at that stage a call. I have defined a custom rule for evaluation, and this call is evaluated in the context of the dataframe given (remember that dataframes are lists, and you can eval a symbol inside a list). ## its class is:  "call"
Within the R language, promise objects are almost only seen implicitly: actual function arguments are of this type. There is also a delayedAssign function that will make a promise out of an expression. There is generally no way in R code to check whether an object is a promise or not, nor is there a way to use R code to determine the environment of a promise. There is a way to create a promise, through the delayedAssign function. At the time of writing I haven’t found a use case for that, but I’ll be glad to hear about one in the comment! The process of filling the value slot of a promise by evaluating the contents of the expression slot in the promise’s environment is called forcing the promise. A promise will only be forced once, the value slot content being used directly later on. A promise is forced when its value is needed. As said before: the promise is only forced once, so ylab finds its value in the first line of code. Lazy evaluation : Waiting until the last possible moment to evaluate an expression, especially for the purpose of optimizing an algorithm that may not use the value of the expression. Since this method of evaluation runs f as little as possible, it is called “lazy evaluation”. It makes it practical to modularize a program as a generator that constructs a large number of possible answers, and a selector that chooses the appropriate one. While some other systems allow programs to be run together in this manner, only functional languages (and not even all of them) use lazy evaluation uniformly for every function call, allowing any part of a program to be modularized in this way. Lazy evaluation is perhaps the most powerful tool for modularization in the functional programmer’s repertoire. Lazy evaluation (or call-by-need) delays evaluating an expression until it is actually needed; when it is evaluated, the result is saved so repeated evaluation is not needed. Lazy evaluation is a technique that can make some algorithms easier to express compactly or much more efficiently, or both. It is the normal evaluation mechanism for strict functional (side-effect-free) languages such as Haskell. However, automatic lazy evaluation is awkward to combine with side-effects such as input-output. It can also be difficult to implement lazy evaluation efficiently, as it requires more book-keeping.